Good teaching involves creating a teaching persona, your personal teaching style that’s a balance between your authentic self and your professional self. Developing your teaching persona includes finding a personal classroom management style that’s right for you as you promote student learning. Thinking about this facet of teaching is important for new instructors and can be a helpful reflective exercise for more experienced instructors. This workshop will provide you with specific, interactive guidance and best practices on developing specific aspects of your teaching persona and style, along with helpful advice for any who are still learning to become comfortable in front of a classroom. 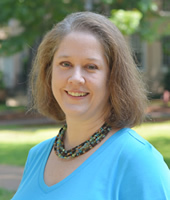 Michelle L. Hardee is the program manager for graduate student TA programs in the Center for Teaching Excellence. She received her Ph.D. in marine science from USC. Throughout her career, Michelle has been actively involved in marine science education and teacher training. She taught throughout her graduate program, as an instructor at Coastal Carolina University and as an adjunct professor of geology at the College of Charleston, and is currently an instructor in the Marine Science Program at USC.